J. B. Harkin is a key figure in Acts of Occupation, yet one about whom there is little biographical information. We were able to put together a picture of his career from government files, but since he left no personal papers, his private, emotional life remained somewhat of a mystery. (Harkin’s biographer E. J. Hart also had little to say about the private side in his recent book, J. B. Harkin: Father of Canada’s National Parks). There seemed to us to be hints of some private frustration that made Harkin especially determined, even unrelenting, in pursuit of his career goals, but we had only guesses in place of conclusive facts. We knew that Harkin had not married until December 1924, the month before his forty-ninth birthday. We knew, too, that the marriage ceremony was carried out at home, by a Presbyterian minister, even though Harkin himself was Roman Catholic. The bride, Jean McCuaig, had worked in the same government department as Harkin for many years. The likelihood was that they had known each other a long time. Harkin’s mother, Eliza, to whom he was devoted, had died of influenza a few years before. Was the difference in religion, which might have upset a devout mother, the reason for his long bachelorhood? This is the kind of question that often teases historians but seldom gets a clear-cut answer. We were therefore delighted to hear from a reader who was also a relative of the Harkins. She told us that her mother had often recounted the story of how “Uncle Bun” (Harkin’s nickname was Bunny) and Jean McCuaig had been in love for years, but waited until after his mother’s death to marry. “This tale of sorrow and romance was piquant enough to be passed on to me after three generations,” she comments. She also provided this beautiful photo of Jean (far right) with her two sisters, Jessie and Anna Isobel. The second photo, taken by Jeff, shows the Harkins’ grave in Beechwood Cemetery, Ottawa. Our thanks to Margot McPherson! James Bernard Harkin and Anna Jean McCuaig’s names on the family grave marker at Beechwood Cemetery, Ottawa. One of the pleasures of archival research is encountering people through the records they’ve left behind. In some cases, documents can give only brief insights, but in others, they can reveal fascinating personalities. Dominion Astronomer Otto Klotz is one of the latter. Our research led us to Klotz because of his membership in the Advisory Technical Board (ATB), which had been created to consider complex or technical matters brought to the attention of the Department of the Interior. We were trying to reconstruct the events surrounding Stefansson’s warning of the (non-existent) Danish threat to Canadian arctic sovereignty, and the origins of the planned government expedition in 1920. Klotz had been a member of the Board (and, it turned out, of its Arctic subcommittee), so we turned to his papers at Library and Archives Canada. Fortunately for us, Klotz was an inveterate diarist, who penned daily entries from 1866 until his death in 1923. He recorded details of his daily life, including his official duties. Even better, he did so legibly and with a delightfully wry sense of humour, making him a very useful and eminently quotable source. In morning meeting of our Advis. Tech. Board and we learned that our memo of last Friday about the Arctic Islands was changed by the Gov’t to an immediate “land expedition” by the Mounted Police to be followed in the spring by one by vessel. — We all smiled. We can see the Mounted Police charging “overland & overice” from Winnipeg to Ellesemere Land — 2000 miles in an fair line — establishing posts, law and order among the musk ox, and above all establishing sovereignty against the wily Danes until the exploring ship arrives next year. We authorized our chairman Dr. Deville to discuss with the Deputy Minister the matter rationally instead of plunging blindly into a wild ill-considered scheme. We all believe in obtaining the sovereignty for Canada, but use reason & common sense to attain the end. Advis. Tech Board meeting in morning. Another resolution about Arctic Islands — recommending immediate effort with a ship to reach Bylot Island; also for a dirigible to proceed from Scotland to Ellesmere Land — some 2000 miles — which it is supposed to do in 70 hours! — and then what? plant the British flag — and impress the Eskimos if there are any — and the musk ox! … — Our whole business is a comedy. In addition to his reports on the ATB’s activities, Klotz’s diary also contains a wide range of observations about his experiences and life in Ottawa. He commented on many aspects of his day-to-day life, including Shakespeare (“I always feel when seeing Richard III played like going on to the stage & murdering the arch fiend — the Duke of Gloucester”), or the date for Thanksgiving (“a most commendable custom”), which was not yet fixed by law (“But as the day has no fixture in our calendar, one can not plan long in advance for the occasion”). The diary’s a fascinating document, and it was one of the many happy discoveries during our research. As with so many of the other figures in Acts of Occupation, Otto Klotz is buried in Beechwood Cemetery, and we found his family headstone when we visited there towards the end of our research. One of his sons (Max) predeceased him by two years, and is buried nearby. As he did with so many other things in his life, Klotz wrote about the sad event in his diary. To learn more about Otto Klotz, see his entry in the Dictionary of Canadian Biography, as well as his Wikipedia page. His papers, including the wonderful diaries, are held by Library and Archives Canada (R6645-0-4-E / MG30-B13), and there’s an online finding aid. Captain Joseph Bernier aboard the C.G.S. Arctic, 1923. Library and Archives Canada, PA-118126. When researching Acts of Occupation, one of our main challenges was to unearth the relevant information from the labyrinth of old government files at Library and Archives Canada. Filing systems in the 1920s were a vast improvement over those used in the nineteenth century, but key facts would often be missing from the major files, only to be found lurking in a minor file whose title might or might not give a clear indication of its contents. To our dismay, even after much searching we couldn’t definitively answer one very important question: how was the decision to send the first Eastern Arctic Patrol in 1922 made? The planned 1921 patrol was cancelled, but J.B. Harkin, Jack Craig, and Oswald Finnie of the Department of the Interior were all determined that in 1922 the CGS Arctic would carry a patrol north. However, their efforts to influence the new Minister of the Interior, Charles Stewart, seemed to have little effect – until, in May 1922, the Cabinet suddenly decided to send the patrol. The main Department of the Interior file on the Arctic islands (RG 85 vol. 583 file 571) was frustratingly silent on how this came about. We could only speculate that Vilhjalmur Stefansson’s entreaties about Wrangel Island had turned the new Liberal government’s attention to Arctic issues generally (p. 146). As it turns out, we weren’t wrong, but the story has a surprising twist to it, involving the famous Canadian explorer Joseph Bernier. When doing research for another Arctic project, I (Janice) found the long-sought documents in file 2502 (“C.G.S. Arctic Explorations & Radio Messages, Reports & Pictures”). Jeff and I already knew that Bernier, his colleague Alfred Tremblay, and a few of their business associates had organized a company called the Arctic Exchange and Publishing Company, and that Tremblay contacted the government in February 1922 with an offer to occupy the Arctic islands in exchange for cash subsidies and the exclusive right to carry out commercial activities there. The file on the Arctic Exchange and Publishing Co. (file 928) shows that government officials disliked the idea and quickly rejected it. As far as file 928 indicates, that was essentially the end of the matter. However, the documents in file 2502 show that early in May 1922, soon after Minister Stewart had met with Stefansson for the first time, another meeting was called – this one to discuss the Bernier plan. Bernier and his associates had persuaded the Minister of Marine and Fisheries, Ernest Lapointe, and a few other Quebec MPs to plead their cause with Stewart. In deference to his colleagues, Stewart agreed to give the plan a hearing. Those present at the meeting were Stewart, Deputy Minister of the Interior W.W. Cory, Harkin, Finnie, Craig, Bernier, Lapointe, and two MPs. But Stewart too rejected the application, which was long on promises but short on practical details. Taking deft advantage of the situation, Harkin, Finnie, and Craig then persuaded him that the government itself must take action. A memo written by Craig on 10 May records the decision – unfortunately, without explaining just what arguments were used to win Stewart over. Bernier personally had no reason to regret the way things went, for he was appointed to once again command his beloved ship, the Arctic. His associates weren’t so happy: for years they continued to send angry complaints that their proposal would have been successful but for the machinations of bureaucrats, and that the company would have done “twenty times as much good work to the advantage of Canada, as you have done with your expensive expeditions.” (Joseph Béland to Lapointe, 15 June 1925, on file 928). Acts of Occupation looks at a fascinating period between 1918 and 1925, when the age of heroic Arctic exploration was coming to an end and the cautious work of federal bureaucrats to establish Canada’s policy on Arctic sovereignty was just beginning. Personalities such as explorer Vilhjalmur Stefansson — a ruthlessly ambitious adventurer with a talent for self-promotion — wrangled with stodgy civil servants like J.B. Harkin, Canada’s first parks commissioner, who regarded the Arctic as part of his domain and thus positioned himself as a player in foreign policy. This is a joint review, along with Peter Pigott’s From Far and Wide: A Complete History of Canada’s Arctic Sovereignty. You can read the review on the magazine’s website. A quick heads-up: one of us (Janice) will be present for a book signing at this year’s Annual Meeting of the Canadian Historical Association. The signing will be held on Monday, May 28, from 5:15-6pm, at the UBC Press book fair booth in the Congress Book Fair, at the Wilfrid Laurier University Athletics Complex. The Canadian Historical Association (CHA) has recognized two Ottawa historians by shortlisting their recent book for the 2012 Canadian Political History Prize. 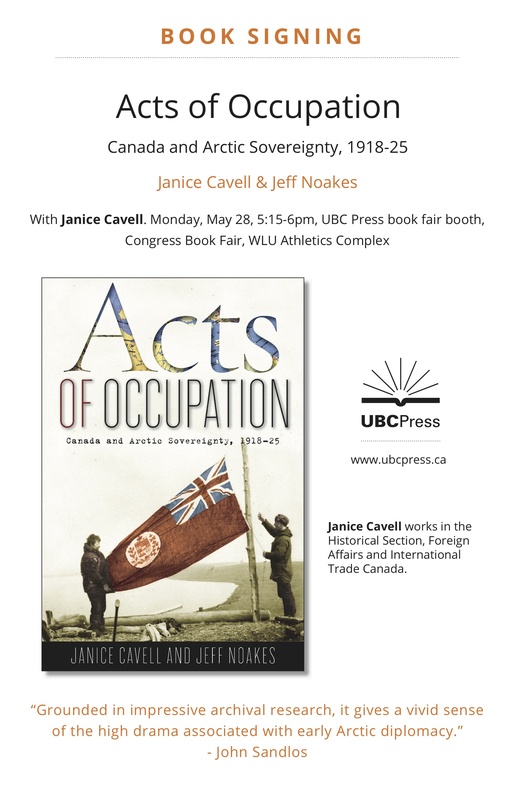 Dr. Janice Cavell and Dr. Jeff Noakes co-authored Acts of Occupation: Canada and Arctic Sovereignty, 1918-25. The book is about early Canadian Arctic sovereignty. Read the full article on the Citizen‘s website. A new book about the history of Canada’s territorial claims in the Arctic has shed fresh light on the impressive, behind-the-scenes manoeuvring by Canadian officials in the 1920s to secure control over the vast region and its untapped resources — a key part of the current Conservative government’s vision of Canada’s economic future. Randy Boswell, “New book details Lester Pearson’s role in securing Canada’s North,” Nunatsiaq News, 31 August 2011.